Beijing and New York-based photographer Taca Sui creates work inspired by the history and landscape of China. His art challenges our preconceptions about nation and nature as well as our expectations for photography itself. Hoes does Taca Sui’s work address the question of national identity in a striking way? Does his art show you something that written ideas about nations cannot? The photographer Taca Sui dedicates himself to the study of China’s most ancient poetry collection, and connect them with the current world landscapes. His works are so striking because he utilizes modern black and white photographs to reflect and express the ideologies and humanities of Chinese traditional poetries. For example, he took a lot of photographs about The Odes, a traditional poetry collection from ancient China. This book involves serving to stimulate the mind and involves love and political attitude towards the Chinese empire. In Sui’s photographs, he not only expresses the beliefs in the poetries but also assimilates them into Sui’s own perspectives. As what Sui said, when he went to a place to take pictures, he always did research on local history and geography first to have a deeper understanding of the place. At the same time, the photographs give the audience opportunities to have stronger emotionally appealing than just reading lyrics. 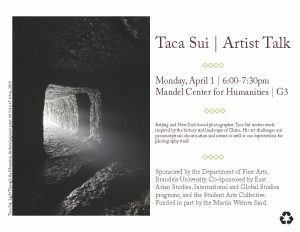 Taca Sui is an impressive photographer and historian with unique perspectives towards art and history, as well as the development of Chinese society. How he tried to use photos to show the stories narrated in the poem and show poetic rhetorics used in Chinese poetry was one of a kind. The example of Two Sons by boat was well presented and, as a Chinese audience, it was very obvious what each photo was trying to communicate. The most impressive part is that his pictures contained history itself and showed the contrast of it with current China. One of the photos he took was simply a dirt road with farming land to the sides. It seemed very bland, but he explained that there is actually a story behind it. The Wei State’s city wall was constructed where the picture was taken. However, when he arrived, the head of the village indicated that the city wall was just pushed down a few weeks ago to subsidize the peasants. What used to be the most important architecture of protection for a great state, a monument with great history was simply taken down. This was very surprising to me because the China that I know is a country that tries to protect their history as well as they can. This brought up the question of what he thinks about the relationship between historical constructs and modernization. Interestingly, he indicated that there are too many historical monuments with great stories from history, that some are not as valuable compared to others. Also, there is a life span for their history story and value. This is what I have never taken into condition. The fact that the Chinese government may not be able to bear the cost of maintaining all historical monuments and constructs explains why such architectures are not kept for longer. Similarly, Nao Shan being a famous mountain nearly 2000 years ago, even had a Chinese character created to represent it. However, not long after Taca took the photo of it, the mountain was taken down. There was no longer modern value for the mountain, which caused it to be taken down. But this left me thinking whether there is still meaning in having the Chinese character that represented it if the original symbol has disappeared. Such messages are not in the written script, and would not carry a more powerful message compared to Taca’s photos. Some of Taca’s work present the places where traditional Chinese literature, such as Book of Odes, mentioned, as well as some remains of old Chinese architecture such as the wall of Wei in Chunqiu Area. Though the literature can be memorized by people, they can’t actually get where the place actually is. To those learners, the places sometimes are just abstract words. Although nation can have some official explanation for those words, the government cannot show people the landscape. Taca perfectly emphasizes the importance of the places mentioned in Book of Odes in his photography. As a student majoring in history and minoring in East Asian Studies, I am fully aware of the importance of traditional Chinese literature and how it subconsciously shapes Chinese’ thoughts. However, few textbooks and Chinese teachers are able to fully and vividly interpret some literature, which sometimes make students hard to understand and make the study tedious. Therefore, from my perspective, his works are significant to the education of traditional Chinese literature and the formation of national identity. However, some of the remains he planned to shoot have been destroyed for modern construction such as giving space for farmers before he arrived. Through the photo of the places where should have had some remains, Taca could somehow evoke the consciousness of people. This is also what the nation cannot achieve. Taca Sui uses his camera to record “The Book of Songs” in his eyes. His successfully combines Western techniques with Eastern cultures, and adds some of his own thoughts. His pictures do not contain too many colors and basically are black and grey. The color of his picture exactly reflects a sense of solemn and stirring —— just like Taca Sui says, because of industrialization, many landscapes disappeared. The landscapes that he records were mentioned by people who lived thousands of year before. At that time, people praised the beauty of these places. However, in order to build a modernized country, the lost of these beautiful landscapes that caused by industrialization and urbanization was inevitable. Nevertheless, Taca Sui does not criticize this situation. Instead, he tries to use his own way to “preserve” these landscapes. Taca Sui’s works are personal since he has his own understandings about photography; his works are also romantic, since he wants to protect something that will be destroyed. Taca Sui’s photography attempts to reinvent ideas of old Chinese mythologies, rituals and ancient collection of poems like The Book of odes and “Grotto-Heavens”. For his collection ‘Odes’, he travels around the areas mentioned in The Book of Odes and uses his camera to react to the landscape with the text in mind. Sui mentions in his description for the ‘Odes’ series: “it was almost as if my emotions and artistic direction were under the influence of some unknown force.” Sui not only followed ‘broad mountains, flowing rivers, ruined walls and ancient paths’ mentioned in the book of odes, he also followed his inner emotions towards the texts and poems; and kept in mind the long and ancient historical background of China. The Book of Odes, being one of the first collections of Chinese poetry, comprising 305 works dating from the 11th to 7th centuries BC, contains shorter lyrics in simple language for the common individual to understand, which fascinated Sui and developed his desire to travel along the path written in the text. Taca Sui does not despise the loss of culture and tradition throughout these thousands of years, he states that the changes in the landscape are inevitable in this fast developing country. Previous PostPrevious BREXIT: Continuing Chaos?